Calcium is necessary for the growth and maintenance of strong teeth and bones, nerve signaling, muscle contraction, and secretion of certain hormones and enzymes. A deficiency in calcium can lead to numbness in fingers and toes, muscle cramps, convulsions, lethargy, loss of appetite, and abnormal heart rhythms. Conversely, excess calcium (particularly from supplements) can lead to kidney stones, calcification of soft tissue, and increased risk of vascular diseases like stroke and heart attack. Most calcium is found in dark leafy greens and dairy. While there is some evidence that oxalates in greens can hinder calcium absorption, they are still a good source of calcium, and the calculated daily value (DV) already takes into account absorption and bio-availability. For more, see the section on calcium absorption. The DV for calcium is 1000mg. 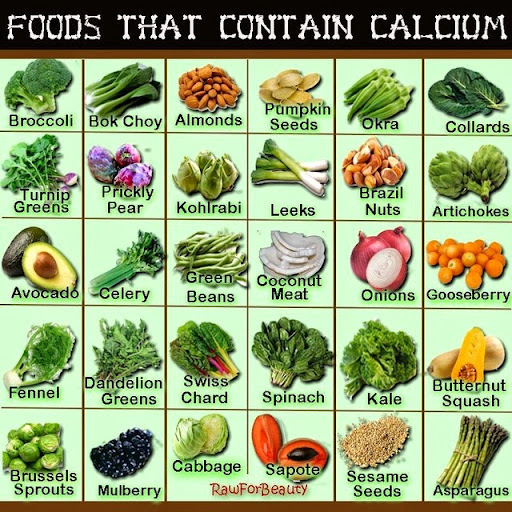 Below is a list of high calcium foods by common serving size, for more, see the extended lists of high calcium foods by nutrient density, and calcium rich foods. Calcium is necessary for the growth and maintenance of strong teeth and bones, nerve signaling, muscle contraction, and secretion of certain hormones and enzymes. A deficiency in calcium can lead to numbness in fingers and toes, muscle cramps, convulsions, lethargy, loss of appetite, and abnormal heart rhythm. Finding calcium in fruits and vegetables is a concern for vegans, or those on a raw food diet. The DV (daily value) for calcium is 1000mg, below is a list of calcium rich fruits.